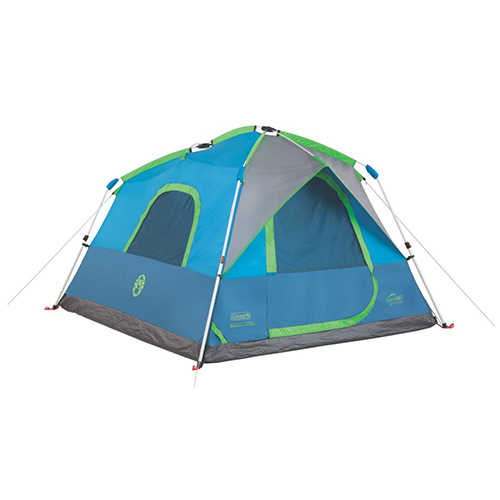 The Coleman 4-Person Instant Cabin tent makes camping easy so you can enjoy every moment of your outdoor adventure. In about a minute you can have the tent set up or taken down. The spacious tent fits a queen-sized airbed. Two inner storage pockets provide a place to put your necessities. Rugged Polyguard 2X fabric, the exclusive WeatherTec system, and an integrated, vented rainfly keep you safer from the weather. You'll love the Illumiline reflective guy lines, as well as the pre-attached poles of this instant cabin. - Center Height: 4' 10"